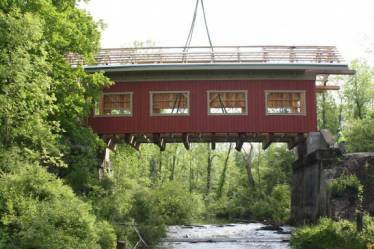 In order to move closer to completion of the 20 mile Maple Highlands Trail, a new bridge was needed to span the East Branch of the Cuyahoga River in Geauga County, Ohio. In September of 2013, the new Maple Highlands Trail Bridge was completed and was awarded winner of the 2013 Governor’s Award for Parks and Recreation. 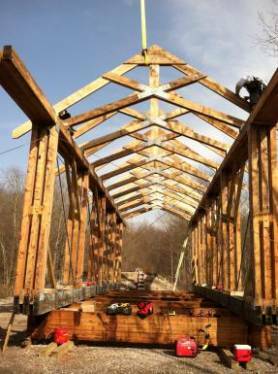 This new 70-foot-long Pratt Truss-style covered bridge features one-of-a kind architectural details which were very challenging to construct and all construction work was done using the Geauga County Park crews only. Because the site for the new bridge originally had a steel railroad bridge that was for the Baltimore and Ohio (B&O) Railroad, the existing structure had to be removed and cleared from the site (except for the concrete abutments) so work crews could begin building the new bridge. When the bridge was over 70% complete, it was lifted into place using a 500 ton crane and set down on the original concrete abutments. Portland Bolt was selected to manufacture a variety of timber bolts, lag bolts, hex bolts, drive spikes and high strength rods for the new construction. All product furnished was 100% domestically manufactured materials and were hot-dip galvanized in Portland Bolt’s 94,000 square foot manufacturing facility. Portland Bolt manufactured, galvanized, and shipped the order in only eleven days after the order was received.